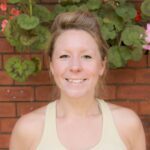 A trained contemporary dancer and mother of two, currently working as a Childminder-Alex has decided to follow her passion for Ashtanga Yoga. Having attended regular Ashtanga Yoga sessions for the past 11 years, Alex has realised the merits of the yoga disciplines for both her mental and physical wellbeing. As a mother and carer to young children, and having recently qualified to teach Yoga for children, Alex can now realise her dreams. Alex is currently training with Nichi and Brian on The Yoga Spaces 250 hour teacher training and will qualify as a teacher in September 2016.